There are some mornings when one cup of coffee just won’t do the trick. That’s what these Coffee-Break Muffins are for. They are chock full o’ brewed coffee (Chock Full o’Nuts, perhaps??) and instant espresso, and give you that double-shot kick in the pants that’s sometimes needed. I’ve been having a lot of these mornings lately. Remember when I said I was busy? Well, I still am…running around so much during the day, my brain can’t switch off when it’s time to go to bed. The reason I haven’t been working this summer is that my husband and I have finally found our own place! Seriously, House Hunters could have done a freakin’ multi-year series on just us, but now we’ve closed the deal on a cool old house in Brooklyn. “Old” being the key word…there are a zillion things that need fixing up, so I’ve been shuttling back and forth to get estimates from painters, plumbers, contractors, floor refinishers, you name it…reasearching and meeting these guys is a full time-time job itself. The work has hardly begun, but our apartment lease is almost up, so we move this weekend–yikes! Oh yeah, and we have almost no furniture…we’ll be eating dinner in camping chairs in the middle of a construction zone for awhile. Should be an adventure! It’s a good thing I made a full batch of these muffins. They are great freezer food and can be defrosted in a matter of seconds for a quick caffeine jolt! For the recipe, see Baking: From My Home to Yours by Dorie Greenspan, or read Chocoholic Anonymous, as it was Rhiani’s choice for TWD. Don’t forget to check out the TWD Blogroll! Good luck on your moving adventures and this new phase of your life! Congratulations on your new house and on the move! It’s stressful now but what fun it will be once everything is fixed up and your have it all the way you like it. Best of luck with the move! Congrats on the new place! I know what it’s like to do the lawn-chair thing- at least it’s fun the first night or two. 🙂 Great looking muffins! Congrats on the house- these muffins look delish! I used espresso as the liquid. With all your busy-ness, a shot of espresso might not hurt. I hope there’ll be lots of reno photos. I love a good coffee break, but I’d love it even more if I had muffins with coffee packed right in 🙂 These look fabulous. Congrats on the house!!! So exciting! Congratulation on what sounds like a fantastic place. Good luck with everything!! Take pictures. 😉 Hope the muffins give you some extra energy, too. Congratulations on your home Steph! Reading your post brought back a lot of fun memories for me when we gutted and remodeled our home a few years back…patience and flexibility were key in our staying sane! 🙂 Good luck with the remodel work, and looking forward to hearing about your progress. I like your homey, cozy photo with the muffins in the basket and the cool looking coffee pot in the background. Congrats on the new house! Glad you liked these muffins- they look great! Good luck on the move….so exciting! I want to see before and after pictures of your new house!! I love remodling jobs, especially on older homes! Congrats! Your muffins look very goood, Im glad you liked them! Thanks! I’ll do my best to get some photos! These look so good!! Amazing. Congrats on your new place, and thanks for baking along in the midst of all your construction efforts! moving is always an adventure, but congrats on your own place!! one day me and the fiance will have one of our own as well, can’t wait! Congratulations on your new home! I think using outdoor furniture is a prerequisite when you get a new home. When I bought my first house, I used a patio table for a TV stand for a good six months. wow these look delicious! i love anything coffee-flavored! Don’t forget to take lots of “Before” pictures. Muffins are gorgeous…also interesting coffee container in the background. Had to look at it awhile to figure out what it was. Thanks! Chemex makes the best coffee!! Yours lasted long enuff to make it to the freezer!! Congrats on finding a house. Have fun with it. Your muffins looks gorgeous. And congrats on finding your new home. These muffins were great! I made mine with Chai Tea. Sounds like a very fun adventure to me…your first house, how wonderful!! 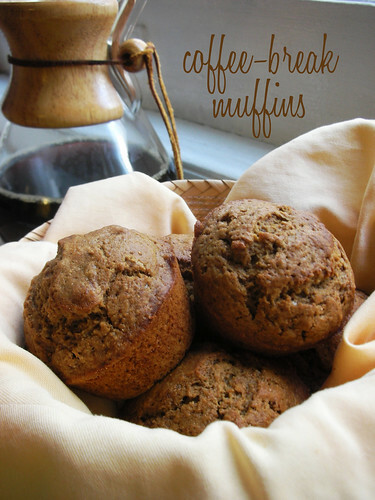 These muffins were great, and I don’t like coffee! Yours are so pretty. Congratulations!